I found copies of the landmark papers by Moore and Glasberg, regarding the nature of hearing impairment and loudness summation. Their models are arcane. But if you manage to wade through them, you begin to realize that my Conductor equations for sensioneural hearing impairment are spot-on too. A recruitment curve can be had for any increasing measure, by first subtracting a threshold value, and then plotting its logarithm. Negative differences are discarded. Right at threshold the curve becomes very steep, but as the measure grows, it eventually approaches ideal hearing. At issue, however, is the slope of the curve near threshold, and its specific curvature. Otherwise, any monotonically increasing model will show similar behavior. My assumption with Conductor was that an elevated threshold represents a barrier below which we cannot hear, and that the apparent sound that we do hear, once above threshold, is measured by the number of Sones above that threshold. So for normal hearing with a threshold of 0 dBHL, we have apparent loudness given as: . But for impaired hearing we have , where represents the dBHL of an elevated threshold. This abstract form for representing hearing impairment, by way of subtracting a threshold amount from a loudness measure, is essentially what Moore and Glasberg also assumed. So if I am wrong, then so are they. And so this is my second vindication from other researchers, for my own notions of how hearing works. The results embodied in Crescendo show that we are on the right track. which is to say, that the gain needed, , is such as to give the impaired listener the same sense of loudness as would be heard by an unimpaired listener. That is the whole essence of Crescendo, applied separately to each analysis bandwidth. In each band, the absolute threshold of hearing is subtracted from the sound level in dBSPL to form dBHL, and then the gain equation is solved for gain using the threshold elevation at the band frequency. The gain for each band is applied to the sound to warp the sonic spectrum to suit the needs of the impaired hearing of the listener. What remains, in Crescendo, is the magic of determining what threshold elevation to use for each frequency band. And physics allows us to orthogonalize the solution to provide a single knob, called vTuning, instead of 155+ knobs, to align the correction levels to the listener’s hearing. vTuning represents the estimated, or measured, threshold elevation at 4 kHz. From that single measurement, we know how the threshold elevation changes for other frequencies. for power, , measured in dBHL. The choices vary in what value to use for exponent, . Crescendo uses the preferred exponent, , obtained from my lab measurements. It represents the average slope over the range 40 dBHL to 85 dBHL, which is the most important range of RMS presentation levels for listening to music. Exponent, , changes slowly over that region, dropping slightly at the loudest levels, and starts from purely linear behavior ( ) at threshold levels. But it is nearly constant over the important musical range. A strict interpretation of Steven’s law would have . And a viewpoint that only 3rd order nonlinearities exist would use exactly . What the simplified Sones equation fails to show is that cannot be computed in the same manner, because our hearing becomes linear at threshold levels. And furthermore, the effects of damaged hair cells is not considered. 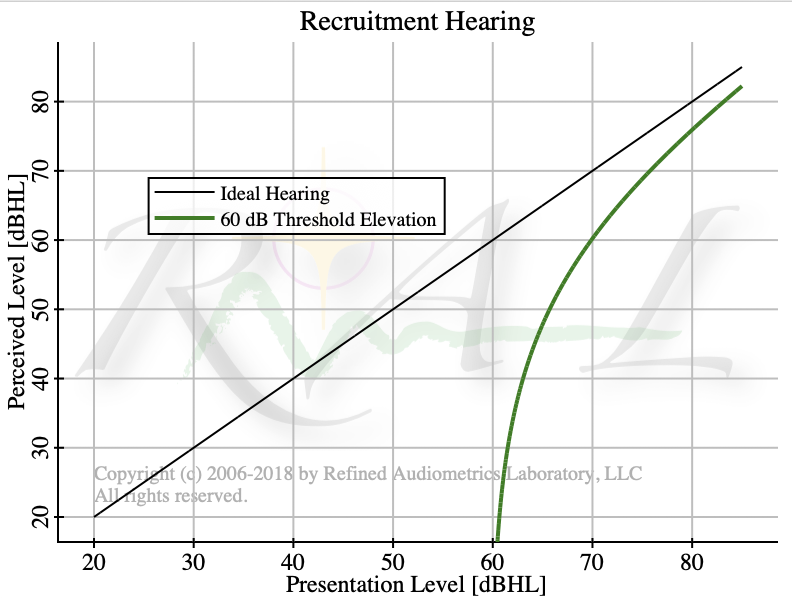 This effect is fairly small for most cases of impaired hearing, with something less than 1% of the hair cells being damaged even when the threshold elevation is as high as 60 dB. But, these issues notwithstanding, over the range of interest for musical listening, any one of these equations could be used, with resulting gain errors less than 1 dB.